Brown lacewings are small to medium-sized insects (forewing length 3 to 9 mm in Florida) which are predaceous both as adults and larvae. They prefer soft-bodied insects such as aphids, mealybugs, and also insect eggs. Because of the longevity of the adults, months in some species; voracious appetites, for example Micromus posticus (Walker) larva consumed an average of 41 aphids during its life (Cutright 1923); and high reproductive capacity, one female Hemerobius humulinus Linnaeus can lay 460 eggs (Smith 1923); they are useful biological control agents. Some species have been used for this purpose, but limited work has been done. 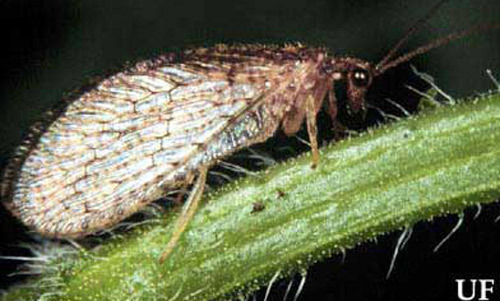 In Texas, Sympherobius barberi Banks is mass reared for control of the citrus mealybug (Hart, personal communication). Florida has a small fauna of 10 species in four genera, and this publication provides keys to identification of the adults. There are 58 species in North American. All the Florida species are found in northern Florida, and three of these, S. occidentalis, S. gracilis, and B. fidelis), were recorded for the first time for Florida from Gainesville. Boriomyia speciosa has not been rediscovered in Florida since Carpenter (1940) recorded it from Sanibel Island. Sympherobius amiculus, S. barberi and H. stigma are known as far south as Highlands County, whereas both species of Micromus are found throughout peninsula Florida. Micromus subanticus also is also found in the Keys and in the Caribbean). Hemerobius humulinus and H. stigma are Holaretic, but the former is relatively uncommon in Florida. Adults have a wing venation with two or more branches arising directly from the fused stem of R1 + Rs (Figure 1). The wing membrane has microtrichia (contrasted with Chrysopidae), ovipositor not exerted, antenna moniliform and front legs not raptorial. Figure 1. Adult brown lacewing (Neuroptera: Hemerobiidae). Photograph by University of Florida. Figure 2. Adult brown lacewing Hemerobius sp. (Neuroptera: Hemerobiidae). Photograph by Ken Gray, Oregon State University. Larvae have jaws which are fairly straight basally and curved apically, mandibles lacking teeth along medial margin, pretarsal claws lack a trumpet-shaped empodium (a spine or lobelike process) (except 1st instar), and are not trash bearers, in contrast to many statements in the older literature (e.g., Comstock 1925, Introduction to Entomology, p. 297). Adults are commonly attracted to lights. Adults and larvae can be found by beating or sweeping plants, especially oaks and pines and plants with high aphid infestations such as alfalfa. Brown lacewings resemble green lacewings (Chrysopidae) but are brownish and are less common. There are 58 North American species. The eggs are laid on plants, but not stalked. 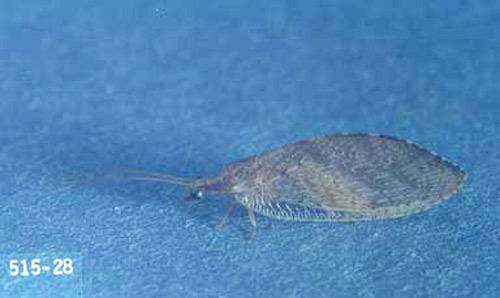 The brown lacewing larvae differ from green lacewing larvae in that they do not possess tubercles (a small knoblike or rounded protuberance). 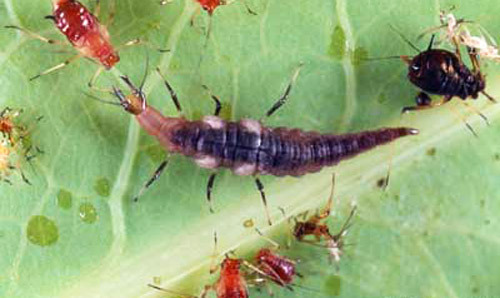 Both adults and larvae prey on aphids, other soft-bodied insects and mites. Figure 3. Larva of a brown lacewing (Neuroptera: Hemerobiidae) preparing to attack and feed on an aphid. The black-colored aphid to the right was probably parasitized by a wasp. Photograph by Lyle J. Buss, University of Florida. Observations: M. subanticus is found throughout Florida and also in the Caribbean (Cuba, Dominican Republic, etc.). It occurs in a variety of habitats including both trees and grasses. It is often found in alfalfa fields where both larvae and adults feed on aphids. Observations: In most of the Nearctic Region this is the most common Micromus, but in Florida it is apparently somewhat less common than subanticus and does not occur in the Keys. Its habitats are similar to those of M. subanticus. Smith (1923) and Cutright (1923) published biological observations. Observations: Recorded here for the first time from Florida (34 specimens from Gainesville, March to September). Observations: Carpenter (1940) recorded female specimens from Sanibel Island but we know of no new records from Florida. Few specimens are known so that the constancy of the wing markings must still be verified. Observations: This holarctic species appears to be uncommon in Florida. Killington (1937) and Smith (1923) provided biological data. Observations: This is the most common Hemerobius, ranging from the Panhandle to Highlands County. Smith (1923) gave some biological data. Adults hibernate. Tjeder (1960) synonymized stigmaterus Fitch. Observations: This is the most widespread U.S. species and has been introduced into Hawaii for biological control. It is being released in Texas or control of citrus mealybug. In Florida there are records from Escambia County to Hillsborough County. Observations: This is an uncommon species recorded here from Florida for the first time (two males, Gainesville, March, October). Besides the distinctive wing venation and male ectoproct, the forewing markings are characteristic with veins dark brown and cell pattern similar to S. gracilis, but with the gradates more boldly margined. Observations: This uncommon species is recorded here from Florida for the first time (14 specimens from Gainesville, May to July). Observations: This appears to be the most common species in Florida, ranging from the Panhandle south to Highlands County. Smith (1923) described its biology. Both male terminalia and wing maculation are distinctive. Carpenter FM. 1940. A revision of the Nearctic Hemerobiidae, Berothidae. Sisyridae, Polystoechotidae and Dilaridae. Proceedings of the American Academy of the Arts and Science 74: 193-280. Cutright CR. 1923. Life history of Micromus posticus Walker. Journal of Economic Entomology 16: 448-456. Dean HA, Hart WG, Ingle S. 1971. Citrus mealybug, a potential problem on Texas grapefruit. Journal of the Rio Grande Horticultural Society 25: 46-53. Killington F. 1937. A Monograph of the British Neuroptera. Vol. II. The Ray Society, London. p. 1-269. MacLeod EG. 1960. The immature stages of Boriomyia fidelis (Banks) with taxonomic notes on the affinities of the genus Boriomyia. Psyche 67: 26-40. Short DE, Mizell RF, Fasulo TR. (1998). Woodybug: A knowledgebase of pest and beneficial arthropods of Florida woody ornamentals UF/IFAS. SW-19. Smith RC. 1923. The life histories and stages of some hemerobiids, and allied species. Annals of the Entomological Society of America 16: 129-151. Smith RC. 1934. Notes on the Neuroptera and Mecoptera of Kansas, with keys to the identification of species. Journal of the Kansas Entomological Society 7: 120-144. Tjeder B. 1961. Neuroptera Planipennia IV. Hemerobiidae. South African Animal Life 8: 296-408. Tjeder B. 1960. Neuroptera from Newfoundland, Miquelon, and Labrador. Opuscula Ent. 25: 146- 149. Originally published as DPI Entomology Circular 227. Updated for this publication. Publication Date: August 2001. Latest revision: October 2011. Reviewed: December 2017.